The property is relatively private (owner lives in separate, near by unit to care for animals) The 14 acres include woods, pastures with horses. There is ample room to explore right on the grounds. The home is well used, comfortable and ideal for families with children. There are two bedrooms with Queen beds and a back bedroom with bunk beds, a single twin bed and a crib. There is a fourth small bedroom downstairs. All first floor rooms connects to the outside. One of our most favorite reviews begins with, "This property reflects an appreciation of childhood." Indeed we create magic with the open spaces, swings, a playhouse in the woods, animals including chickens, ducks, bunnies, horses and dogs. We are mostly okay with dogs as well but like to talk about what that looks like ahead of time. Due to the special nature and privacy of the property and surrounding hills the place has also been used for retreats, and other special occasions. Although we no longer do weddings. The cottage in the woods is where children can play creatively and independently---inspired by the book The Last Child in the Woods. This book documents the need for intimate connection to nature and to independent fantasy play for children. The cottage is surrounded by trails leading to an open meadow of five acres. There is also a suspension bridge! There is a coop with chickens, ducks and rabbits. Young kids can access the coop to collect eggs with parental supervision. Many children spend hours in the chicken coop. 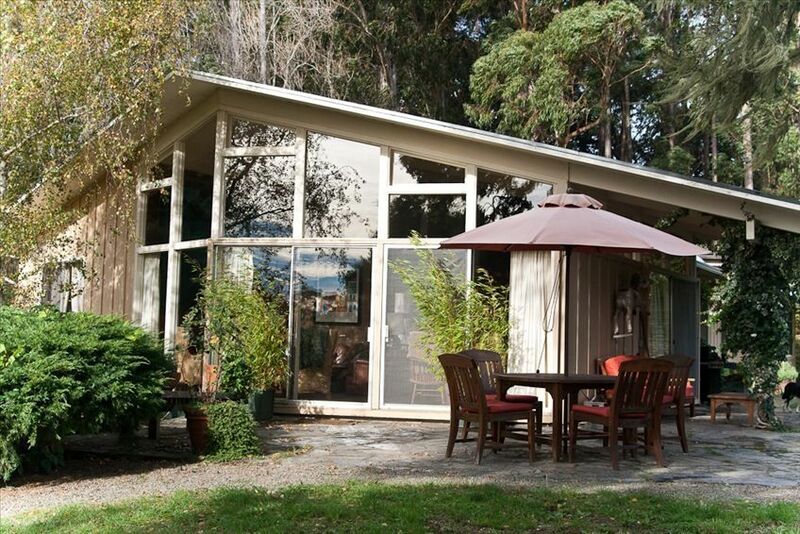 There are views of surrounding hills and the Bolinas Lagoon and access to nearby trails in open space and parkland. One mile from the town of Bolinas which has two miles of beachfront and locally caught fish in season, abundant organic produce and Niman meats. The property is also just three miles from the Audubon Canyon Ranch where one can watch seals and all kinds of bird life on Bolinas Lagoon; and 10 miles from Point Reyes Park HQ with its extensive trails, beaches and wildlife. I have lived on this property for over 40 years and it is a nurturing and spiritual place for me--completely private and still. For people who value those two things it is ideal. We also have built a playhouse/cottage in the woods where children can play independently and creatively and there are all kinds of animals on the place. I try to keep up with the calendar--house full time--sorry. House is rented about half the time, used for family part time and we also donate for auctions to raise money for non-profits. The best way to inquire about availability is to email me--I am very prompt. Also for special holidays and for most summer months we hope to rent the house for the week. There might be some flexibility but keep that in mind in your inquiries. When we saw the property in the late '70's we did not hesitate--it was the ideal place to raise a family....as well as have tranquility and deep connection to nature as an important aspect of our daily lives. when my grand-kids come their first response is often, "there is nothing to do here." I agree with them! Then, within an hour or two they are gone--into the woods enjoying the magical opportunities for creative and independent play that this property offers. Watching the lagoon for its varied wildlife, gardening, horseback riding, animal care, and sitting in the meadow enjoying a drink at the end of the day while watching the kids roam over the meadow. Often, roasting marshmellows around a fire-pit at night. Property is 15 acres and surrounded by open space and parklands. Totally private with lots of animals including dogs, horses, chickens, ducks and a bunny named Sugar! WE have not had a hot tub running due to the drought but this spring has been a blessing and our hot tub is up and running!!!!!!!!!!!!!!!!!!!!! Peaceful place to stay for a family or group! A wonderful home and property! We've used this home several times to house participants attending programs at a local non-profit. Without exception, every year our participants were treated like guests. Linda personally welcomed them to the house and property. Everyone loved their three night stay. Highly recommended every year! Our family - three adult couples and a toddler - had an absolutely wonderful stay at this property over the Christmas holidays. With much of the group coming from abroad, we were looking to rent a house in California that would facilitate spending quality time together over the holidays. This house exceeded our expectations. The highlight is the setting -- it's on a hilltop with a beautiful view of a lagoon and surrounded by rolling fields, a few minutes drive from a charming small town and beach. Our toddler LOVED the chicken coop at the bottom of the yard, feeding the horses, and exploring the small children's cottage in the woods as well as the paths and bridge to get there. Right outside the kitchen doors is a patio and, coming from the city, our son was really thrilled to be able to go outside by himself anytime he wanted to play with the Batman big wheel that lives there. (And our dog was thrilled to hang out with the two very friendly resident golden retrievers). The adults loved all this plus the various swings hanging off tree branches scattered around the field. The set-up of the house worked really well for three adult couples and a child, giving the adults some separation of space from each other but with one bedroom nicely adjacent to a bedroom wonderfully set-up for children. With a crib, bunk beds, toy buckets and stuffed animals, it was that rare surprise - to find ourselves in a house even better setup for children than our own. And the kitchen was very well equipped for cooking serious meals. The owners were warm, welcoming, helpful and thoughtful - a real pleasure to interact with. We were absolutely touched at the gift they handmade for our son (a play on his name), as well as the stocking stuffers they gave us for the stockings hanging off the fireplace in the children's cottage. And the gorgeous, tall Christmas tree they volunteered to set-up. We are all hoping to find a future occasion to return and meanwhile, strongly recommend this property to others! The property was as wonderful as the pictures suggested. We all had a wonderful and spirit rejuvenating experience on this ranch. Our 5-year-old son was able to feed the horses and chickens, swing on the huge swing that viewed the mountains and the lagoon, we all enjoyed the beach via the cool little town of Bolinas, and overall our family and friends simply enjoyed the 14 or so acres of space to breath. We will be coming back. PS Lastly, we had fun discovering "Sweet Pea Cottage" at a remote end of the property. This house and the land it’s on are very special and perfect for bringing family together! We had an exceptional experience staying on this gorgeous piece of property in a very well equipped and comfortable house. The hosts were gracious and attentive. The chickens provided us some eggs, the trees some plums, and the horses a beautiful visual as they ran freely around the pasture once a day. We will definitely make our way back here for another family gathering. This beautiful, bright, clean, spacious home is set on several acres of stunning open land, overlooking the Bolinas Lagoon. Linda's gracious hospitality and amazing warmth was an unexpected treat. I hated to leave and cannot wait to return.